The reward for a pleasant hike from Miracle Rock campground is to find the rock itself, still defying gravity. This photo is the lazy person's view, taken from the road. It looks much more interesting up close. I did not want to spoil it for you! Camping information below, after my jewels of wisdom. The quality of the camping experience is not just based on the campsite itself. It also depends on your state of mind, and what you are after. Maybe you just want to get away from the routine, breathe fresh air, and relax in a canvas chair with a cold one. In that case, you probably want a place that is quiet, scenic, not too crowded. Or maybe camping is part of some other outdoor activity, like horseback riding, mountain biking, ATVing, hiking, fishing or hunting. Then you will be looking for a site that is reasonably close to trails or bodies of water that accommodate that activity. If you have a handicap, or physical limitations it might be important to check out some sites ahead of time to be sure they will accommodate your needs. A developed, or designated, campsite provides more comfort and ease, but tends to be more crowded, and less secluded. Potable water on site, or hauling plenty with you? Picnic tables or lap? Outhouse or “cathole”? It depends on your needs and what is important to you. 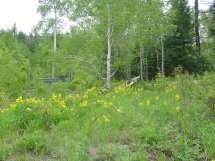 If you decide to find a “dispersed” or undeveloped site on BLM or Forest Service, there are guidelines to follow. They help ensure that the whole forest doesn’t end up looking like one continuous campground. If you find that the Pigpen’s were there first, you have 3 obvious options. Move on hoping to find a pristine place you can make your mark on. Camp in their mess and be pissed off at them. OR enter into a transcendent state and pick up their litter. Yes, you heard me right. When it is done, you will probably enjoy the campsite more, and will feel connected to principles beyond yourself. Whether or not you call it karma, metaphysics, “passing it on”, or the Golden Rule, your good acts will return to you and your fellow campers. If you are the Pigpen's, wise up. Your actions will also come back to you. The good news is that there is still time left to change your ways. Camp at previously used sites where possible. Research has shown that the most rapid negative changes to soil and vegetation occur during the first few times a campsite is used. Camp at least 200 feet away from lakes and streams to minimize impacts to riparian areas and prevent contamination. Firepans or stoves are recommended when camping on BLM lands. A fire pan is a metal tray used to contain a campfire and prevent the fire from blackening the soil (oil pans work great!). Before breaking camp, it is a simple matter to transfer cold ashes into a plastic bag or other container for disposal at home. If you use a fire pan carefully, it is possible to leave a campsite with no scars or evidence of your use. The use of firepans may be banned during high fire danger periods. Avoid building new fire rings. Unnecessary fire rings scar the natural beauty of sites and reduce the amount of space available for sleeping and cooking areas. There are usually plenty of existing rock fire rings in popular recreation spots. Use only dead and down wood for campfires. Bringing your own firewood is the best policy to practice. Both dead and live trees add to the scenic qualities of campsites. Do not put cans, bottles, aluminum foil, or other non-burnable trash into a fire ring. These items do not burn, and their presence may lead subsequent users of the site to build a new fire ring. Burn campfire logs to ashes, then douse with water. Do not smother a campfire with soil, as this will make it difficult for the next visitor to use the same fire ring. If you must leave a campsite before the fire burns all of the wood, douse the fire with water before you are ready to leave camp, then stir it with a stick, then douse it again to make sure it is completely out. Dispose of human waste properly. The use of portable toilets is highly recommended. If no portable toilet is available, solid body waste and urine should be buried in a hole six to twelve inches deep. The disposal site should be located away from streams, campsites, and other use areas. Toilet paper should be placed in a small plastic bag and put into your camp trash bag. Pack out your trash (and a little extra). For years, public land managers have promoted the "pack-it-out" concept in an effort to foster self-cleanup ethic among public land users. This program has generally been successful. Most people no longer leave or bury trash at campsites. The City of Fruita owns 4 reservoirs on Pinon Mesa. They no longer use the water, but they do sell water to some Glade Park residents who are on the pipeline. These reservoirs are primarily recreational, and are stocked with fish. The locals used to call this spot the “Ranger Station Campground.” It is located just below Fruita Reservoir #2. As the name indicates, the Forest Service currently considers it a picnic area rather than a camp ground, but it is not illegal it camp there. It just has parking areas rather than campsites, and you need to pack trash out. It does have some facilities. It has outhouses. A well provides potable water. The Forest Service indicates that at times a sign may recommend boiling the water, if testing is not current. I am not aware of bear problems, but take precautions with food. This area also has a small amphitheater with podium and surrounding benches, for meetings, speakers, weddings, etc. Groups of 75 or more need to get a permit by contacting the Grand Valley Ranger District, Grand Mesa National Forest Service, 970-242-8211. “Haypress” Picnic Area – Forest Service This area is just below Fruita Reservoir #3. Though it has had picnic tables and a restroom in the past, I am told they may be removed. The Forest Service says that it is now considered open camping, which means that it has no facilities (restrooms, trash cans, or water.) 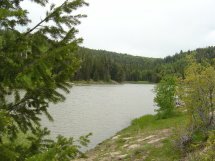 It is a popular campground for people fishing at Fruita Reservoir #3, but campers should be prepared to bring their own potable water, possibly a portable toilet, and pack out trash. Black bears have been known to visit campsites here, so care should be taken to secure food. Information: The U S Forest Service District Office is located at 2777 Crossroads Blvd, Suite 1, Grand Junction, Colorado 81506, (970) 242-8211. The City of Fruita owns 80 acres surrounding and including Enoch's Lake. Actually it is a large reservoir, surrounded by quakie and spruce. City of Fruita has put in a few concrete picnic tables, and fire rings. There is one outhouse, but many of the campsites are a little hike away (plan ahead.) Most who camp here are fishing. There is some hillside terrain, so if you need level ground this may not be the best spot for you. The City of Fruita asks that minimum impact camping be observed. Please do not create new fire circles; do not use fire circles to dispose of trash; and pack out trash. Take precautions to secure food so that bears are not attracted. 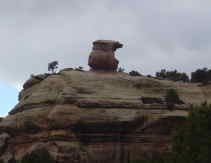 Please let us know about your Glade Park/Piñon Mesa camping experiences. Write a review of a campground, or impart your knowledge.